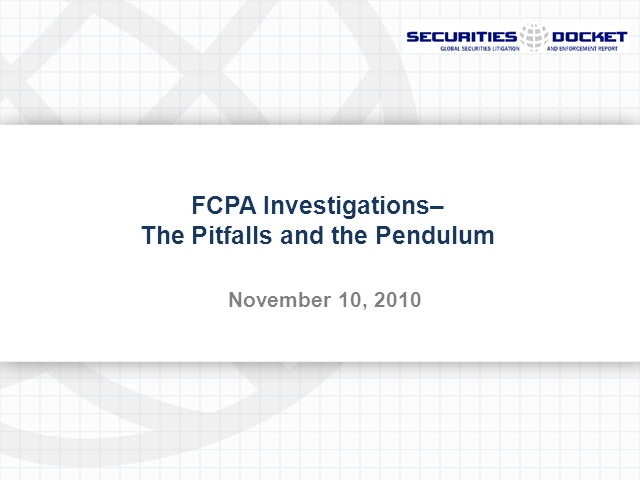 In this webcast, top current and former SEC officials will discuss FCPA investigations from every angle. Given the SEC’s new specialized FCPA unit; the new whistleblower provisions contained in the Dodd–Frank Wall Street Reform and Consumer Protection Act (which reward informants who provide certain types of information leading to successful securities actions, including FCPA actions); a hefty SEC budget increase; and increased SEC/DOJ Collaboration, 2011 and beyond will undoubtedly result in an onslaught of FCPA enforcement actions and prosecutions. This webcast will focus on how best to handle internal FCPA investigations, which are inherently complex, high stakes, and international in scope. Our panel of seasoned SEC and FCPA veterans will discuss a broad range of FCPA-related issues, covering not only how to (and not to) conduct a successful FCPA investigation, but also how to handle critical eDiscovery and other data and digital forensic challenges which routinely crop up during an internal or government investigation.